For some, the idea of having a budget written down on paper can be daunting. It sounds like so much work – who wants to keep track of every single thing they buy? It’s much easier to stick your head in the sand and avoid the reality of seeing where your money is going every month. Having a monthly budget is a great way to actually set and meet your financial goals to ensure your financial security. Without a budget, you could be spending money aimlessly, doing harm to your long-term financial health. 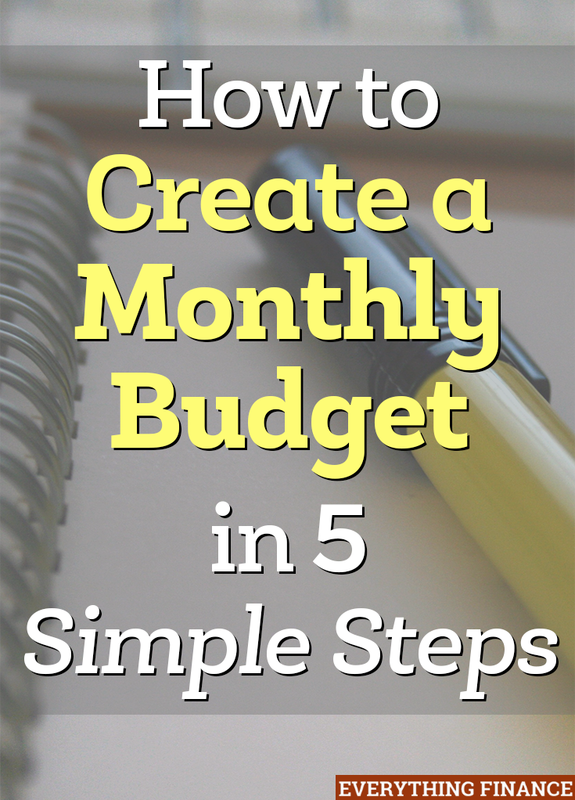 If you’re feeling overwhelmed with the idea of creating a monthly budget, fret no more. Here are five simple steps to get started on creating a monthly budget. Figure out your total take-home pay after taxes and deductions (401K contributions, health insurance, flex spending, etc). This will help you see how much money you’re actually bringing home every month. Do you get paid bi-weekly? Then two months out of the year, you’ll bring home three paychecks instead of two. Think of these months as “bonus” months where you can increase contributions to savings. Now create line items in your budget for everything you spend money on that you know the actual amount of. For example, your rent or mortgage, your utility bills, cell phone bill, debt, student loans, etc. These are items that you pay every month without fail and usually cost the same from month to month. Then you have your variable expenses. These are also expenses that you have every month, but they can fluctuate a bit. For example, groceries, gas & transportation, dining out, etc. Your irregular expenses are expenses that occur quarterly, or annually, rather than on a monthly basis. For example, your car insurance or car registration could fall under this category, as could HOA dues or annual memberships. Total up these annual irregular expenses and then divide by 12—you will now contribute this amount into a savings account monthly so that you’re never met with a “surprise” bill you have to scramble and figure out how to pay. Now that you know your total income, your fixed expenses, variable expenses, and irregular expenses, you’re ready to get started with your financial goals. Chances are you either realized that you have no idea where some of your money goes to, or that you’re spending too much every month to have anything left over to contribute to your financial goals. This is the wrong way to think of your monthly budget. Instead, you need to look at your variable expenses and figure out how to reduce line items or eliminate them completely. Can you go without the fancy gym membership? Can you forgo expensive beauty routines? Can you stop clothes shopping for a while? Can you pack your lunch instead of dining out every day? Once you’ve eliminated some expenses, then reduce all the other line items by 10% across the board. That means if your dining out budget is $200, reduce it to $180. If you were spending $300 on groceries before, you’ll now be spending $270. 10% isn’t much, but it will now allow you to contribute that money toward savings instead, putting you one step closer to reaching your financial goals. While setting up automatic savings is the last step in creating your monthly budget, it will actually be the very first step in your monthly budgeting process from now on. Why? Before you pay anything else at the beginning of the month, you’ll have money automatically withdrawn every time you’re paid, or on the first of the month—whatever works with your budget. The point is, by setting up automatic savings deductions that take money from your checking account and automatically place it into your savings account, you’ll be able to start working toward your financial goals. If you need help with a monthly budget template, consider creating your own in Excel, finding one on Pinterest, or using a plain old pen and paper notebook like I do. You can also snag free budget templates from sites like BudgetsareSexy.com or ChristianPF.com. When did you first set up your monthly budget? How long did it take you to get started? Do you find budgeting easy or difficult? What method do you use to budget?